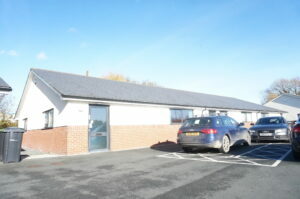 Cooper Green Pooks Commercial Property Consultants of Shrewsbury report the recent letting of Unit 4 at Burnside Court, Leominster Enterprise Park. The new tenant is Heart Systems Ltd who already occupy Unit 3 and required extra space due to expansion of their business. Unit 3, a single-storey office unit with a floor area of approximately 119 sq m (1291 sq ft) offers high quality office space in a good location with easy access on to the A49. The asking rent was £9,500 pa.
Alessio Dyfnallt, who handled the letting, said “These units have proved to be very popular and we were pleased to assist Heart Systems with their requirement for additional space whilst remaining in the same location. Burnside Court has proved a popular location and all units are now occupied.